Description: This herbaceous perennial plant is up to 3½' tall and similarly across, sending up one or more leafy stems that branch occasionally. These stems are erect, ascending, or arching-spreading; large robust plants often have a shrubby appearance. The stems are light green, terete, and hairy, although the lower stems have a tendency to turn reddish brown and become hairless as they age. The white hairs along these stems are usually scattered and spreading, or less often they are confined to vertical lines; upper stems are sometimes short-pubescent. 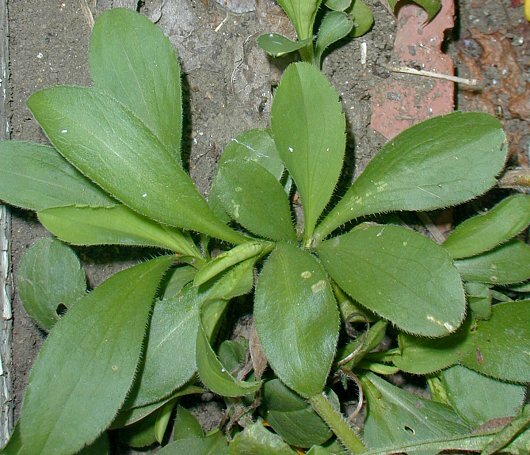 The alternate leaves along these stems are up to 4½" long and ¾" across toward the base of the plant, becoming gradually smaller as they ascend the stems. The lower to middle leaves are lanceolate-elliptic, oblanceolate-elliptic, or elliptic in shape, while the upper leaves are narrowly oblong or linear-oblong in shape. Usually the lower to middle leaves have a few teeth toward their tips, while the upper leaves are toothless; all leaves have soft-ciliate margins. The leaves taper gradually toward their bases, where they are either sessile or clasp the stems; their tips are often pointed and stiff. 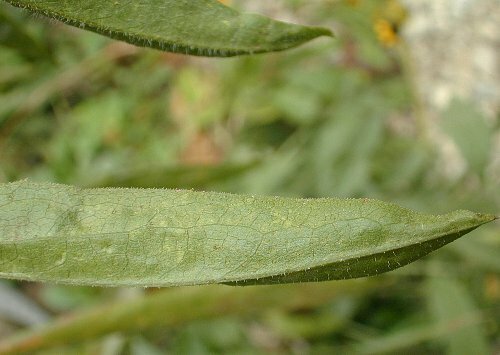 The upper leaf surface is medium green and glabrous to sparsely appressed-pubescent, while the lower leaf surface is light green and glabrous to hairy along the major veins. 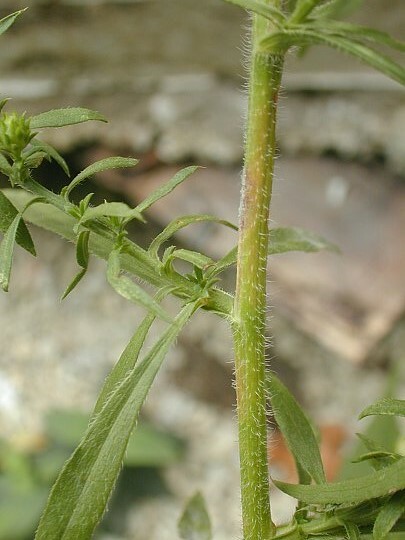 There are often small tufts of secondary leaves that develop from the axils of the primary leaves. The secondary leaves have characteristics that are similar to the primary leaves, except they are smaller in size. The upper stems terminate in panicles of flowerheads up to 2' long and 1¼' across; they are usually ascending or slightly arching. Each panicle has a central rachis, several spreading to ascending lateral branches, and shorter secondary branches with flowerheads. Small leafy bracts are abundant along the rachis and branches of these panicles; they are up to 1¼" long and ¼" across, resembling the upper leaves, except usually smaller in size. Like the upper stems, the rachis and branches of these panicles are light green, terete, and either scattered spreading-hairy, hairy in lines, or short-pubescent. Individual flowerheads are about ½–¾" across, consisting of 15-35 ray florets that surround a flattened head of disk florets. The petaloid rays of these flowerheads are white (rarely light pink or light blue-violet), linear-oblong, and widely spreading when the flowerheads are fully open. The corollas of disk florets are yellow and short-tubular in shape with 4-5 recurved lobes. Later, the corollas of disk florets become reddish purple to reddish brown. Scale-like phyllaries (floral bracts) surround the base of each flowerhead in 4-5 overlapping series. Individual phyllaries are about 3 mm. (1/8") long and linear-lanceolate in shape with slightly recurved tips; they are mostly light green, except toward their tips, where they are mostly medium green. The peduncles (basal stalks) of the flowerheads are up to ¾" long in length. The blooming period occurs during the autumn for about 1½ months. 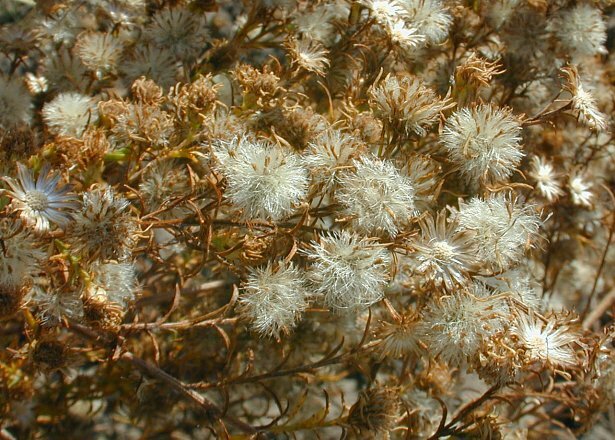 Afterwards, the florets are replaced by achenes with small tufts of white hair; they are distributed by the wind. These achenes are about 1-1.5 mm. long, linear-oblanceoloid in shape, slightly flattened, grayish, and faintly ribbed. The root system of mature plants consists of a branched caudex, from which spreading rhizomes originate. After the flowering stems die down, semi-evergreen rosettes of basal leaves develop and persist from autumn into the spring. These basal leaves are up to 3" long, 1" across, and elliptic to oblanceolate in shape. The margins of basal leaves are either toothless or sparingly toothed towards their tips, and they are ciliate. The upper surface of basal leaves is medium green and glabrous, while the lower surface is light green and usually hairy along the major veins. Cultivation: The preference is full sun, mesic to dry conditions, and soil containing loam, clay-loam, sandy loam, or gravelly material. As the summer progresses, it is normal for the lower leaves of this plant to wither away in response to drought or foliar disease. The flowerheads are usually produced in great abundance and often remain in bloom until heavy frost. This aster is easy to cultivate, but it can spread aggressively by reseeding itself, especially in open disturbed areas. Range & Habitat: The Frost Aster occurs in every county of Illinois (see Distribution Map), where it is native and quite common. Typical habitats include disturbed areas of upland prairies, weedy meadows, openings in upland woodlands, savannas, limestone glades, rocky cliffs and thinly wooded bluffs, pastures and abandoned fields, roadsides and areas along railroads, edges of yards and gardens, vacant lots, and various kinds of waste ground. This is the weediest aster in Illinois. It often colonizes disturbed areas, where it competes with many of the more common Eurasian weeds. Faunal Associations: Like other asters (Symphyotrichum spp. ), the flowerheads of this plant attract many kinds of insects, including honeybees, bumblebees, little carpenter bees (Ceratina spp. ), cuckoo bees (Epeolus spp., Triepeolus spp. ), long-horned bees (Melissodes spp. ), leaf-cutting bees (Megachile spp. ), Halictid bees, plasterer bees (Colletes spp. ), Andrenid bees, Sphecid wasps, Vespid wasps, Ichneumonid wasps, Braconid wasps, Syrphid flies, bee flies (Exoprosopa spp., Villa spp. ), thick-headed flies (Conopidae), Tachinid flies, flesh flies (Sarcophagidae), blow flies (Lucilia spp. ), Muscid flies, small- to medium-sized butterflies, skippers, moths, and various beetles. These insects feed on, or collect, nectar and pollen from the flowerheads (Robertson, 1929). Oligolectic bees that have been observed to visit the flowerheads of Frost Aster (Symphyotrichum pilosum) include Melissodes dentiventris, Colletes simulans armata, Andrena asteris, Andrena nubecula, and Andrena simplex. Other insects feed destructively on the foliage, flowerheads, stems, or roots of the Frost Aster and other asters. These species include larvae of the Papery Blister Gall Midge (Asteromyia laeviana), Tarnished Plant Bug (Lygus lineolaris), Broken-backed Bug (Taylorilygus apicalis), a leafhopper (Empoasca alboneura), larvae of a Gelechiid moth (Gnorimoschema subterranea), and larvae of a butterfly, the Pearl Crescent (Phyciodes tharos); see Stireman et al. (2010), Snodgrass et al. (1984), Dmitriev & Dietrich (2010), Felt (1917), and Opler & Krizek (1984). Other insect feeders include leaf beetles, weevils, larvae of the Aster Leafminer Fly (Calycomyza humeralis), aphids (especially Uroleucon spp. ), the Aster Leafhopper (Macrosteles fascifrons), Meadow Purple-striped Grasshopper (Hesperotettix viridis), Scudder's Short-winged Grasshopper (Melanoplus scudderi), and Blatchley's Walkingstick (Manomera blatchleyi); see Clark et al. (2004), Majka et al. (2007), Spencer & Steyskal (1986), Pepper (1965), Blackman & Eastop (2014), Cranshaw (2004), Vickery & Kevan (1985), and Arment (2006). In addition to these insects, the Moth Table lists additional species of moths that feed on asters. Among vertebrate animals, the ecological value of asters is more limited. The Ruffed Grouse and Wild Turkey feed on the leaves and seeds of these plants; the Tree Sparrow also eats their seeds during the winter. Among mammals, the Cottontail Rabbit and White-tailed Deer browse on the foliage, especially when these plants are still immature, while the White-footed Mouse eats the seeds (Martin et al., 1951/1961). Photographic Location: The photographs were taken at a postage stamp prairie in downtown Champaign, Illinois, and at the webmaster's wildflower garden in Urbana, Illinois. Comments: The Frost Aster (Symphyotrichum pilosum) is perhaps the most common aster in Illinois. It is often treated as a weed, but some people allow it to develop and bloom during the autumn because of the showy flowerheads. Because of the variability in the hairiness of individual plants and other characteristics, some authors have described two or more varieties of Frost Aster, although they won't be discussed here. The appearance of Frost Aster is similar to several other asters (Symphyotrichum spp.) with small white flowerheads. It is often larger in size than these other species, although small specimens of Frost Aster also occur. Compared to the common Panicled Aster (Symphyotrichum lanceolatum), the Frost Aster has more hairy foliage and it prefers drier habitats. Another similar species, the Calico Aster (Symphyotrichum lateriflorum), has smaller flowerheads with fewer petaloid rays than those of the Frost Aster. The Calico Aster also prefers shadier habitats, such as woodland borders and woodland openings. 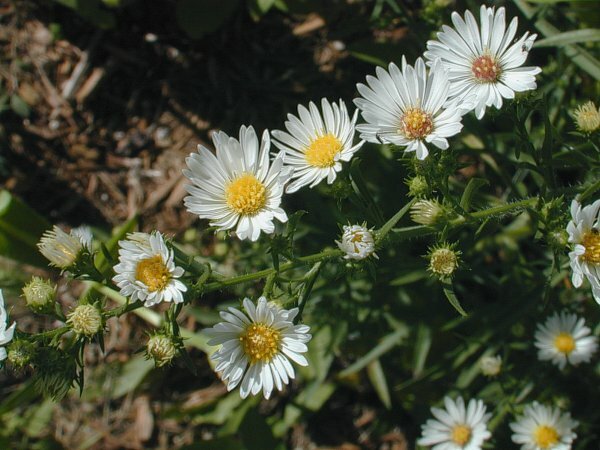 Yet another species, the Heath Aster (Symphyotrichum ericoides), also has smaller flowerheads with fewer petaloid rays, and its leaves are smaller in size. This latter species is typically found in prairies. All of these asters were assigned originally to the Aster genus, thus the Frost Aster was referred to as Aster pilosus.